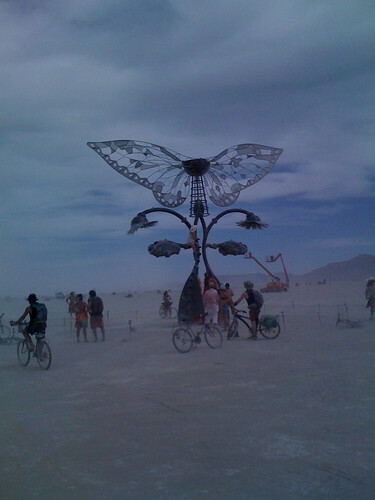 Burning Man is an art festival that occurs annually in the Black Rock Desert of Nevada. Emergent community, radical self reliance and a gift giving environment are some of the attributes of this unique happening in Nevada. 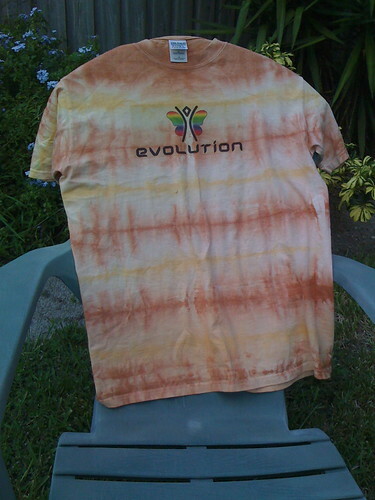 Evolution was the theme this year. So what's it all about? I hated it. I know it's not cool to say that. But, it's true. I hated it. Why? Well, there I was, minding my own business, sitting at home in Florida enjoying the comforts. The weather was finally cooling down. Let me tell you: when it cools down in Florida, nirvana sets in. But, don't let *that* get around. Anyway, I got an email asking if I was interested in going to Burning Man. Hmmmm. I've been out in a tent enough to know what a commitment to preparation it is to camp in the desert. But, I agreed to go. Arrival was similar to driving up from Dublin into N. Ireland on the Belfast Road. I recalled crossing the border. There were watchtowers, spotlights, people marching around. Stress. Anxiety. I was in a van with my friend. A couple of guys were eyeing us. They frowned, walked up and my friend got out of the van. I bristled. My friend said "They want to search the van". I just sat there and glared at them. We had nothing to hide. But, the idea totally pissed me off. My friend explained, "They say some people try to hide in vehicles. It costs $300 to get in..."
After the search, we moved forward in the van. Then, we pulled up a few yards further and more people approached the van. This time, they skipped up with big smiles and didn't hesitate to say hi. And, these gals said "Get out" and laughed! 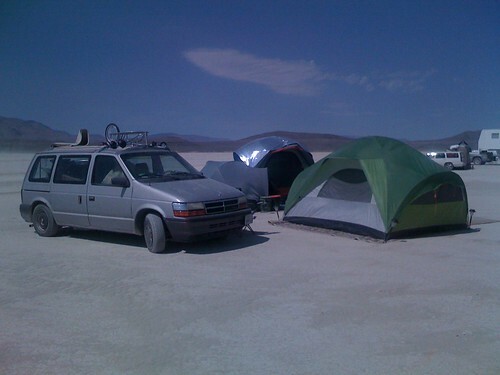 They asked us if we'd ever been to Burning Man before. My friend had, but it was my first time. That made me a, yes, you guessed it, a virgin. "Virgin, virgin, la la la!" they shrieked. Smiling, dancing around me and sort of pushing me playfully, she said "Well, you're gonna get dirty eventually. You might as well do it now!" I had no idea what she was talking about, but I liked this a lot better than those guerrilla looking dudes that wanted to frisk me. I sure as hell was wondering what I paid $300 to do this for while the search was going down. I said "What do you want me to do?" It seemed harmless enough, so I did what she said. "Lay down on the playa!" she shouted. Then, she kicked dust on me. and screamed "Roll over!" laughing hysterically. It actually was fun. All the adrenaline drizzled away. I relaxed. I guess I kind of like being a little dirty, so this was OK. The girls handed me a big piece of rebar (a steel rod, for those of you who haven't grown to love rebar as one does). They pointed to a big bell and said "Ring that bell cuz you're not a virgin any more!" So, I hit it as hard as I could. It rang even louder than I expected. People all around me started clapping. Cheering. I felt great. I was so relaxed. That part was over. We drove through the gate and into the playa. The area was arranged like a clock, with spokes from 2:00 to 10:00. 10:00 pointed north. These were the the words they came up with to stand for the letters on the spokes of the hub: Adept, Biolog, Chaos, DNA, Fossil, Genome, Hominid, Inherit, Jurassic, Kinship, Lineage. I had two thoughts when we set up camp: first, I wanted the wind at our back. I also remembered Christopher Alexander's "A Pattern Language" of architecture where he suggests facing east is best, so you rise with the sun. I was asking my self why, why I had done this. Why had I come all this way and payed so much money to be so uncomfortable in, of all things, the desert? All my life I've loved camping. But, I've always camped in beautiful spots. I'd only read about the desert, particularly in Edward Abbey's "Desert Solitaire". The girls at the gate were right. Playa dust was getting all over everything. But, once we got camp set up, everything changed. That magical feeling of self reliance set in. And, as it did, I felt better. Meanwhile, camps were setting up all around us. And soon, the inevitable happened. It got dark. 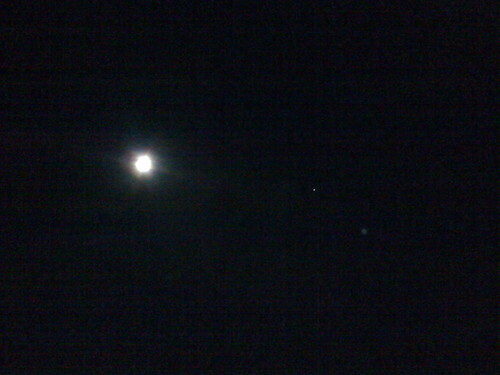 The moon rose and it was full and wonderful. The temperature dropped from about 100F to near 70F dramatically. It would later get as cool as 50-55F. The whole thing changed as darkness fell. People had created objects of art that came alive in the darkness. 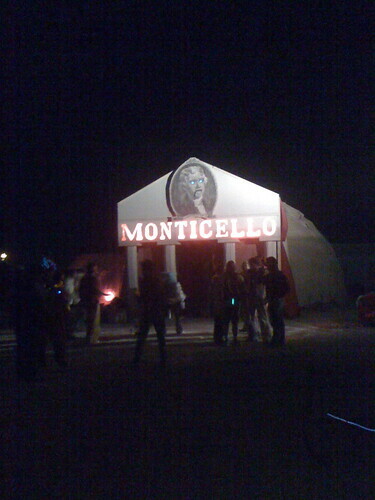 You can see one amazing structure called Monticello in the photo above. The facade was an entryway to a huge, geodesic dome. Inside was a nightclub. 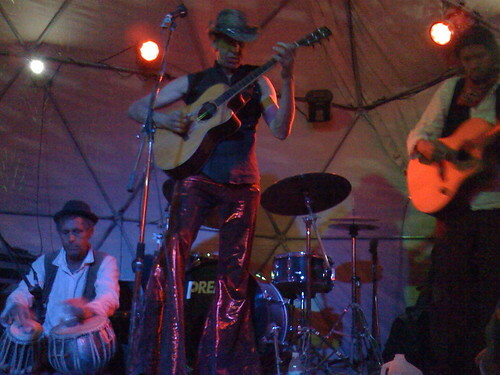 That's Danny Heines, Tim on the tablas and Tom Lattanand on guitar to the right playing some amazing music inside the geodesic Monticello venue on the playa at Burning Man '09. 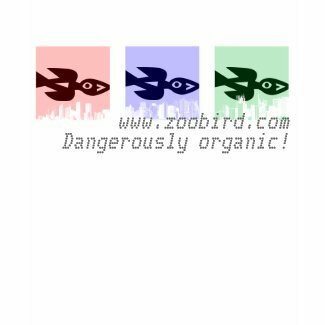 In fact, you might click here and listen to some music by Danny or here and listen to some of Tom's music as you read this. 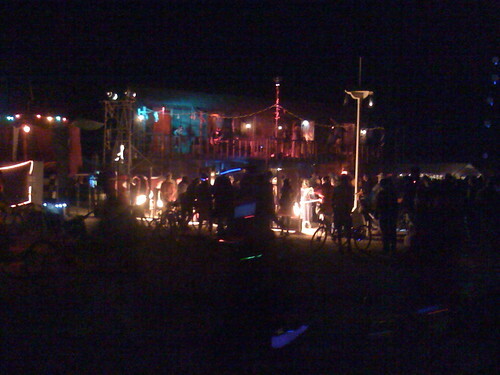 Here's another nightclub that popped up on the playa. This one has a balcony with a master of ceremonies, a continuous playlist of live bands and dancers. 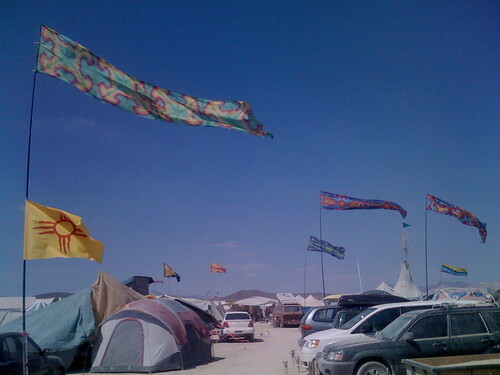 The next day, I went to a huge tent called Center Camp. 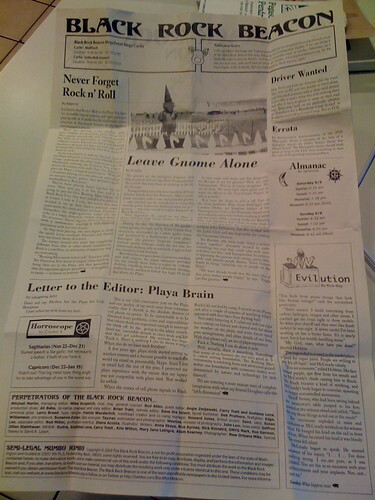 Copies of the Black Rock Beacon had been printed. 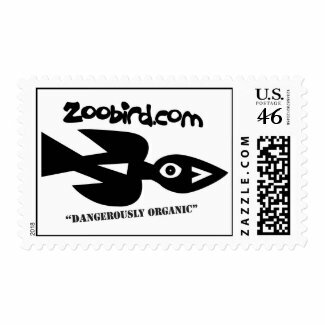 The newspaper was another element of this emergent community. There's no commerce except coffee in Center Camp. 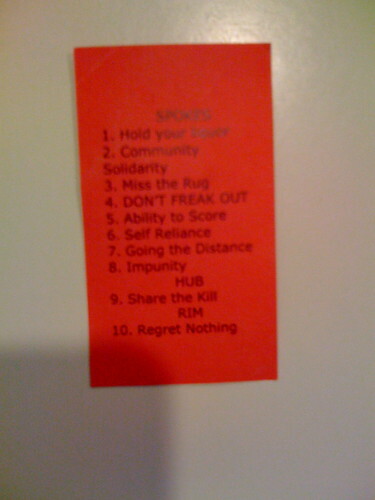 Gift giving is the thing to do at Burning Man. 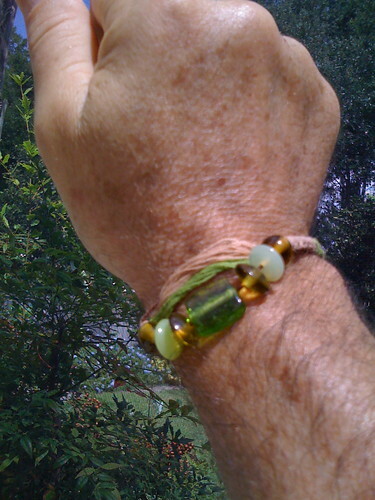 A couple made these bracelets for many of us. 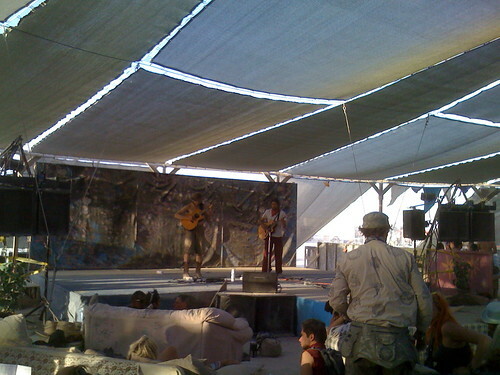 Center Camp was place where you could relax, out of the elements, get some coffee, a massage, hear some music or get involved in some dance or yoga. That's Danny Heines, and Tom Lattanand playing a set. Click here to get a sense of what it sounded like in there. 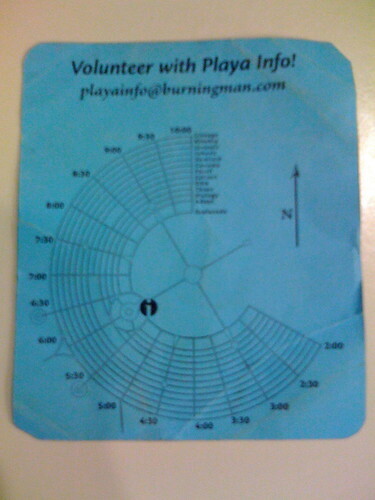 Playa names are fashionable at Burning Man. Dancing Shiva made these t-shirts. He gave them out as gifts. 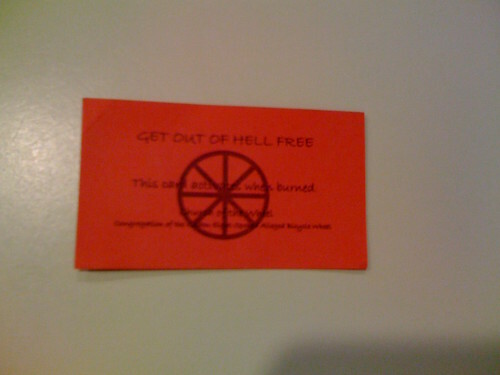 This is my "Get out of Hell Free"card. It's a gift I particularly enjoyed getting. GET OUT OF HELL FREE. This card activates when burned. Church of the wheel. Congregation of the Golden Eight-Spoked Alleged Bicycle Wheel. 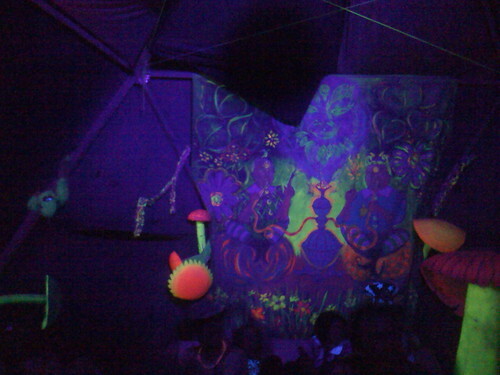 This was another view inside a geodesic dome turned nightclub. 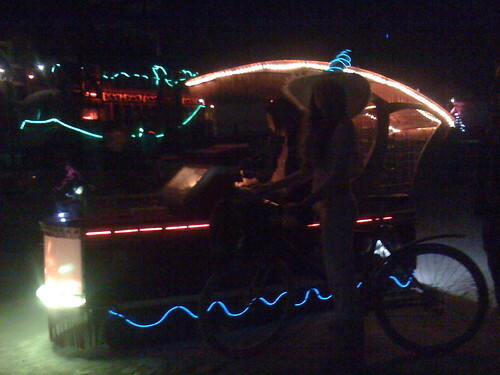 There were art cars that lit up at night. 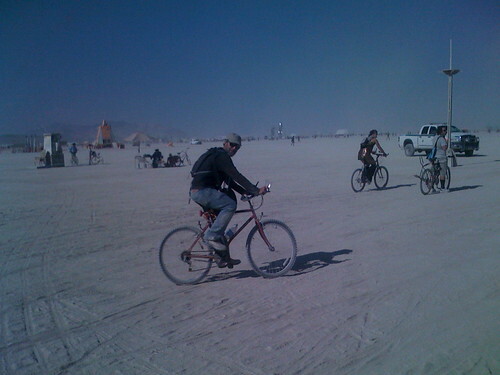 This one has a keyboard that the driver played as it scooted along in the dusty, cool playa. It looked post-apocalyptic. 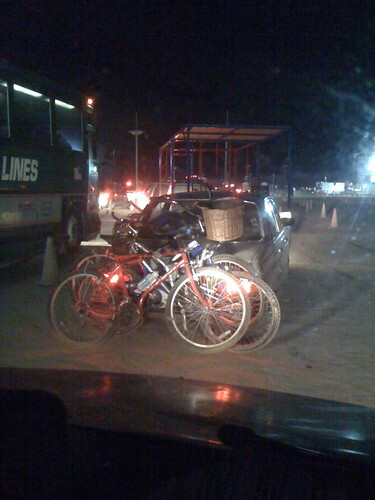 Bikes are the way to go on the playa. You can get a sense of the scale of the the desert in this photo. All sorts of creative vehicles popped up everywhere. 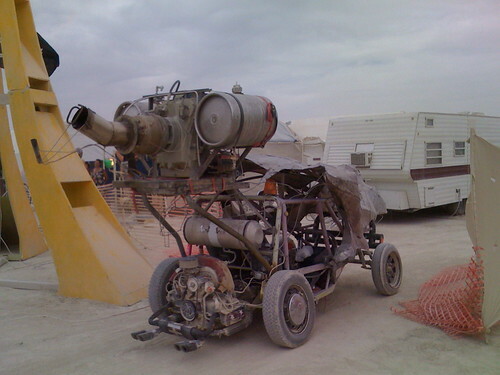 This is a jet-equipped dune buggy. You can't imagine how loud it was. 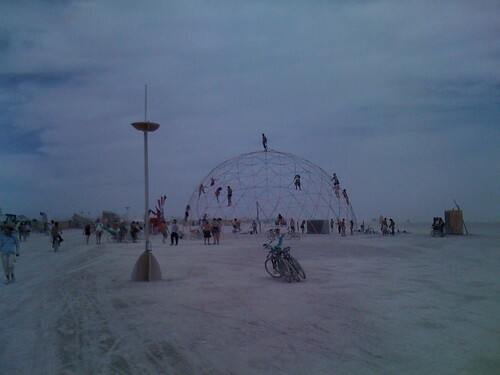 I loved this geodesic dome. It had a sign on it that read "Days since last accident: 0". There was the most amazing art all over the playa. Art that moved. Art you could drive. Art that you could burn. Hmmmm. 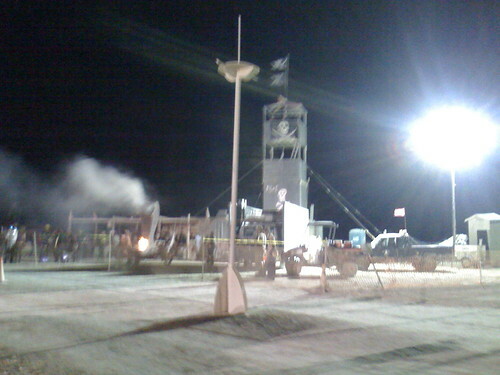 That leads us to the climax of the event: Burning man. 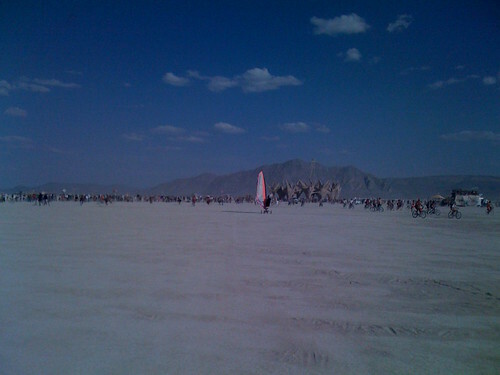 You can get more sense of scale looking across the playa at this view of the Burning Man effigy. Dust storms kicked up frequently. Dirt devils appeared. Sometimes, the dust was so thick you could barely see your hand held in front of your face. 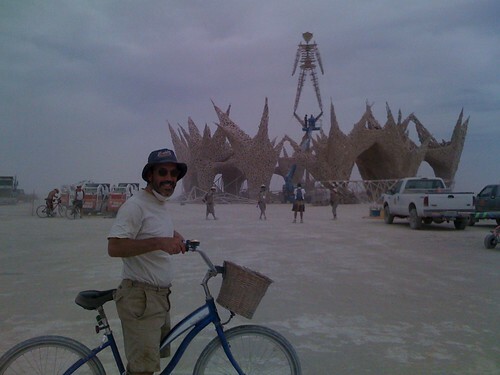 I rode my bike out to the Burning Man effigy days before it was to ignite. It was a huge structure, all wood. 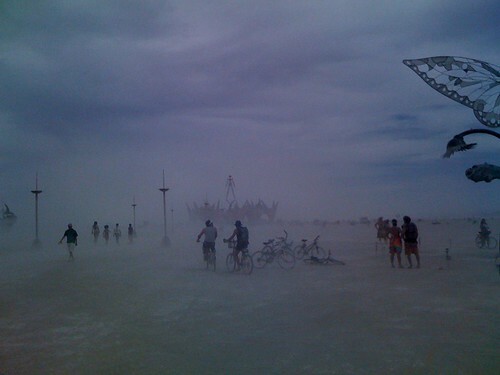 The burning of the effigy on the last day of Burning Man was incredible. 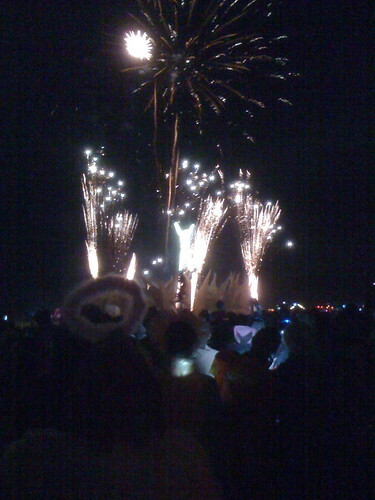 Fireworks, huge blasts of flame, all architected to deliver the most dramatic spectacle you could imagine. So, it's true. 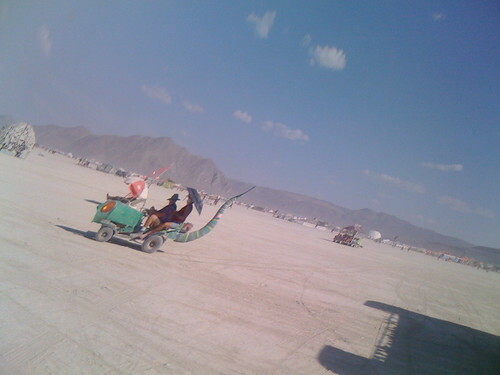 I hated Burning Man. At first! Now, I'm daydreaming about next year's gathering. The Checkers Hamburger ad says "Checkers - You Gotta Eat!" Gotta get out and do stuff! Thanks for this quote: “The world is a book and those who do not travel read only one page.” - St. Augustine. I wake up every day thinking this is it. This is the day. It could be the last day we have. Ya gotta live it! I still have playa dust that won't wash off...so cool!